Archbishop Philip Tartaglia of Glasgow, Scotland led a series of three talks to priests of the Philadelphia Archdiocese during their biennial convocation May 30-June 1 in Hershey, Pa.
“Priestly humility has evangelical power,” Archbishop Philip Tartaglia of Glasgow, Scotland, told priests of the Archdiocese of Philadelphia during their May 30-June 1 convocation at the Hershey Lodge and Convention Center in Hershey, Pa.
“Do not underestimate the power of your priestly vocation,” he said. 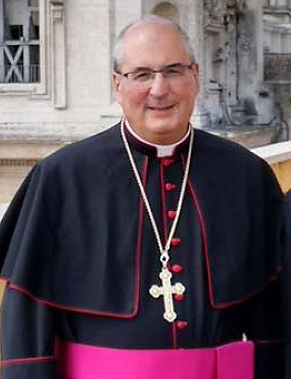 The archbishop, who is president of the Scottish Catholic Bishops’ Conference and was a delegate to both the 2014 and 2015 Synods of the Family in Rome, offered three keynote presentations at the biennial gathering of archdiocesan priests. Priests ought to be “not just many in number and well trained, but to be united in a common faith and purpose.” Priests need “patience, perseverance and trust” to be a “bridge” between God and man, “safeguarding and protecting the grace given us” by God. “None of us is immune” to the stress, loneliness and discouragement, he continued. “Do we pray for each other? Do we pray with each other? Are we attentive to those (priests) in need?” he asked, providing food for thought and matter for examination of conscience. Humility is liberating and empowering.